The story of a momentous point in twentieth-century history – a history that still lives in the streets. The liberation of Paris was a momentous point in twentieth-century history, yet it is now largely forgotten outside France. 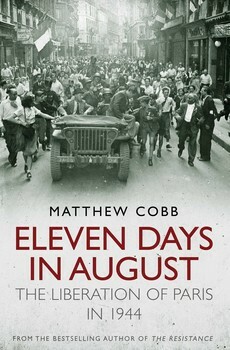 Eleven Days in August is a pulsating hour-by-hour reconstruction of these tumultuous events that shaped both the end of the Second World War and the whole future of France, told with the pace ofLife a thriller. Full of the atmosphere and spirit of the French capital, it shows how, in 11 dramatic days, people lived, fought and died in the most beautiful city in the world. As well as describing the drama, it examines the conflicting national and international interests that played out in the bloody street fighting. The tense, heart-wrenching story is told from conflicting points of view, using eyewitness and diary accounts and unpublished archive material from ordinary Parisians, Resistance fighters, the Free French, the Allied High Command, Allied and French spies, the German High Command, rank-and-file German soldiers and French collaborators. Each of these groups of people experienced these August days in very different ways, praying for different outcomes, fighting for different futures. Hundreds of civilians and soldiers died, some leaving their names on fading plaques on Parisian buildings, but most are now forgotten by history. This book brings their stories back to life, capturing the emotion, the excitement and the terror of insurrection and fighting, and revealing the history that lives in the streets.